We hope that you had fun playing along in our blog hop this last week! The Design Team ladies did such an amazing job! This week the Sensational Sunday Sweet Spot was on Lydia's Blog!! Comment #4 (design team members comments were not counted) - Bonnie AKA Reduse - Stamping in the Light - who said: Awwww, what a cutie pie. Congratulations Bonnie!! Please send me an email at lovesrubberstamps@yahoo.com by April 20th and I will send you your code for a $10.00 gift voucher to the Loves Rubberstamps store! Welcome to the Loves Rubberstamps weekly Sensational Sunday Blog Hop! The Design Team has created some gorgeous projects for your Inspiration. Check out each link and leave a comment. If you get lost along the way, each stop will have a full list of links. One of the Design Team posts is the hop's Sensational Sunday Sweet Spot and a name will be drawn from that list of comments to win a $10 Loves Rubberstamps store gift certificate. So, all you have to do is hop along and see all the creations and leave a little love for the Designers! You have until Saturday, April 13th, at 8pm CST. Have fun and we hope that you enjoy the hop! The inside roses hold the butterfly up so it makes it's own stand. I also added a corrugated heart and the banner and sentiment from the Tattered Angels Vintage Seasons Timeless Romance set. My flourish is the My Favorite Things Fancy Flourish Die-Namics. I hope you liked my card for today - Be sure to check back this afternoon for my "real" project for today's hop!! Have a great day all! Thanks for hopping with us! WOW WOW WOW!! OMG Laura! This is gorgeous! 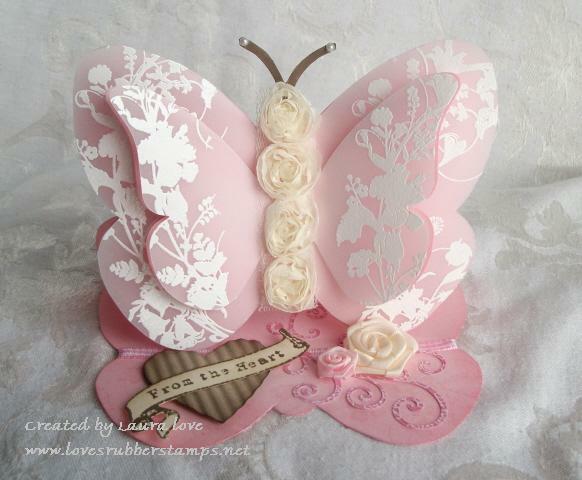 Love the soft colors, the butterfly shape, the gorgeous ribbon, the vellum...everything!! I am sure your grandma LOVE it! Wow, this is a beautiful blast from the past, I love the soft colors and the fabulous design. Your details are so soft and feminine, I'm sure Grandma treasures this one. wow that is a Beautiful Butterfly card!!!! I am sure she LOVED this one!!!! What a gorgeous butterfly Laura! It's truly beautiful...TFS!!! 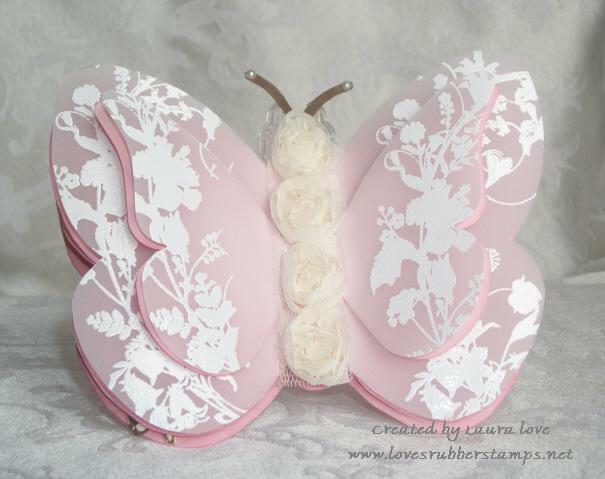 Awwwww so beautiful.. Love the color and the butterfly shape is so gorgeous..
Wow! This is so delicate and beautiful! I am in awe!